Only at WUWT: California's water scarcity is "amusing"
Freshwater runoff from the Sierra Nevada may decrease by as much as one-quarter by 2100 due to climate warming on the high slopes, according to scientists at UC Irvine and UC Merced. Accelerated plant growth at higher elevations caused by increasing temperatures would trigger more water absorption and evaporation, accounting for the projected runoff declines, the researchers add. A diminished river flow will only add to the burden of providing resources to the thirsty farms and homes that rely on it. The state is currently experiencing a severe drought, and some reservoirs and groundwater levels are at all-time lows. The study findings appear this week in the early online edition of Proceedings of the National Academy of Sciences. You can read the full press release here. The research was done by Michael L. Goulden and Roger C. Bales. I couldn't find the study at PNAS early edition. I expect it will be posted online shortly. From the University of California – Irvine and the “Environmentalists are never happy” department comes this amusing quandary. They should be happy about more trees. After all the coal plants are shuttered, they will need the wood to stay warm. Doesn’t increased run off have a lot to do with flooding in California? what a load of hogwash. Water is too serious a matter to let fools like that play with failed computer models. Anyone who extrapolates out that far is not a scientist of any repute or regard. We have to use what water we have in much better ways and technology is rapidly advancing in this area. That advance must not be blocked by these dopes trying to grab so me more climate funding. The problem is really one of unbounded funding. With so many real problems facing every country, this climate overstudy nonsense is both reprehensible and just plain STUPID! Get a job you useless bludgers! Lots of “coulds” in this article as in “it could be with warming”….. Of course the fact that the Sierras are cooling makes it irrelevant . I guess they never leave the air-conditioned office. Trees, foothill forests prolong river flow throughout the year. The forest acts as a sponge for snowmelt, downpours and so on, thus preventing flooding and then their real value kicks in, come midsummer the water flow is clean, cool and steady. Known in many farming areas where the forests were cleared ruthlessly to create farm land. Until the foothill forests grew back, there was spring flooding and summer drought. It’s absurd that California has not spent more on desalinization plants given its population growth and its semi-desert climate. Many desalinization plants have been proposed, but the EPA and enviro-wacko advocacy groups have prevented their development. Another problem in California is the cyclical nature of its precipitation, which closely follows El Nino/La Nina cycles. Stupid political hacks often propose building desalinization plants during dry La Nina cycles, and then defund the projects once El Nino/high precipitation cycles restart…. The US should follow Singapore’s model of rapid desalinization plant development to address their water shortage problem. Until LFTRs are available, reverse osmosis desalinization plants must rapidly be built in California to meet its growing water requirements. I take this seriously, given that water shortages already occur every few years. This paper will make a positive contribution if it persuades people to take steps to provide more water. Denier weirdness at WUWT. I like this comment at the end of Wayman Tisdale's post on current record warm SST numbers. So, global sea surface temperatures are at a record level and we’re not even having an El Nino. Perhaps it was mistaken for sarcasm? Heck, maybe it actually was sarcasm, but I'd like to think not. 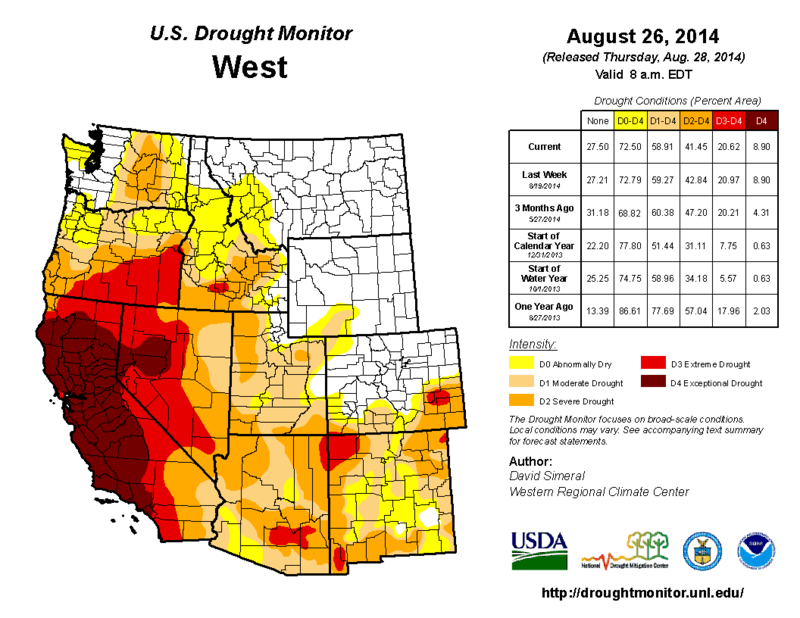 That drought map of CA just keeps getting more awful. Are WUWTers denying the drought yet? That's what they got up to with the midwest drought a couple years ago. Just an excuse to gouge people for their groceries. Despicable behaviour but that's capitalism for you, always screwing the little guy. On second thoughts they probably won't go with that line, so it's happened before and was worse, oh yes it was, nothing to see here, what about that Antarctic sea-ice, eh? Slagging *capitalism* is out of bounds, but slagging big corporations might be OK. I assume people know where Chico is on the map. I wonder how many residents know Chico is the HQ for WUWT. I wonder how many WUWT fans realise that Formal Education in Chico is a heritage men's clothing store. No, really. It's located in downtown Chico and has purchasings (the owner's word) and rentals of full-service suits and tuxedos (for Heartland conventions?). I wonder how many WUWT fans know that 'The Graduate in Chico' is not an Anthony but is a huge bar with reasonably priced drinks and great food. Indeed John. I have been considering the irony of that. I wonder how the Mendocino National Forest to the West and the Tahoe National Forest to the East of the valley in which Chico sits are fairing? This considering that they are each located well within the most drought affected area. Mendocino National Forest has been pretty quiet this summer. Lightening started a fire closer to the coast, northwest of Laytonville. Burned about 13,000 acres, mostly on the ground. Did crown a few times. This is an interesting pair of photos of Lake Oroville about 20 miles east of Chico in the Sierras. I seem to recall Willard denying that the situation up there was this bad a few months ago. What effect is this going to have on agriculture, will 'Blossom Hill' become a thing of the past? Then there is that big ogre California and fracking - Sourcewatch. My immediate response to thoser photos was 'Bloody 'ell!'. My considered response is essentially the same, but more emphatic. How much longer does the drought have to go on to become catastrophic, I wonder? It already is catastrophic. Water allotments to agriculture have been cut to the bone. In the central coast town of Santa Cruz people are being required to cut back consumption by 25%, with draconian fines being levied on those who fail to act (this is far worse than the required cutbacks in the last bad drought there and the fines are much much worse).